The Stoic philosopher Antipater is reported to have drawn an analogy with archery when trying to explain the goal of Stoic ethics. The good Stoic, Antipater suggested, is like an archer: he does everything he can to hit the target, but his happiness does not depend on whether he hits the target or not (Stobaeus 2,76,11-15). What matters is shooting well, for whether the arrow hits the target or not depends on other factors outside of the archer’s control. For the Stoic, then, what matters is not always hitting the target but rather becoming an expert archer, with archery understood as a special kind of art in which expertise does not always guarantee success. This Stoic idea shares something in common with the account of learning the Japanese art of archery in Eugen Herrigel’s Zen in the Art of Archery (London, 1953). Herrigel’s book is a personal memoir recounting his own experience of trying to learn the art of archery from a Japanese master, something he tried to do in order to deepen his own understanding of Zen. Along the way Herrigel makes a number of remarks about Zen and archery that resonate with Antipater’s image of the Stoic archer and may offer a fresh perspective on it. Herrigel begins by reflecting on the artificiality of learning a medieval military art taken out of its original context and turned into a hobby for people who have no need to learn how to shoot arrows. Archery is no longer a matter of life and death. Yet, he comments, “archery is still a matter of life and death to the extent that it is a contest of the archer with himself” (p. 15). It has become a “spiritual exercise” in which “the marksman aims at himself” (p. 14). The modern Zen art of archery “can in no circumstance mean accomplishing anything outwardly with bow and arrow, but only inwardly, with oneself” (p. 18). The goal, then, is ultimately one of self-transformation. One of the greatest challenges Herrigel faced was to relax. His master made the art look effortless, and for him it was. The more Herrigel tried to achieve the desired result (hitting the target) the more he failed. It was a classic case of making a strenuous effort to keep relaxed. The key, his master told him, was to stop caring about the arrow: “what happened to the arrow was even more a matter of indifference” (p. 40). The less one cares about hitting the target, the more smooth and relaxed one’s shot will be, which paradoxically will increase one’s likelihood of hitting the target. So not caring about reaching the goal will in fact improve one’s chances of reaching it. Far more important, though, is a shift in the very goal itself. The real goal should not be hitting the target at all; the real goal is something internal, not external. This “the right art [of archery] … is purposeless, aimless” (p. 46). One must become purposeless, on purpose. One must aimlessly aim the arrow. This will enable one to reach both goals, internal and external: to perfect the art of archery and to hit the target, but wanting to hit the target now looks like part of the problem rather than contributing to either goal. How to do this? The answer is simple: stop thinking and simply let oneself be led by the moment (pp. 49-50), or led by Nature we might say. The master archer will have “no ulterior motive” and will be “released from all attachment” (p. 55). This involves an internal transformation that is central to making progress in the art. Thus, “more important than all outward works, however attractive, is the inward work which he has to accomplish if he is to fulfil his vocation as an artist” (p. 65). The archer performs “as a good dancer dances” (p. 77), which was another analogy also drawn by the Stoics (cf. Cicero, Fin. 3.24). What matters, then, is the performance of the art itself rather than any further outcome, such as hitting the target. Herrigel’s master insists that “if you hit the target with nearly every shot you are nothing more than a trick archer who likes to show off … Put the thought of hitting right out of your mind! You can be a Master even if every shot does not hit” (pp. 78-9). If one does hit the target this is not significant in itself: “hits are only outward confirmations of inner events” (p. 80). Thus all attention ought to be focused on the internal practice of the art rather than the external result. One ought neither to grieve over bad shots nor rejoice over good ones. “You must free yourself from the buffetings of pleasure and pain, and learn to rise above them in easy equanimity” (p. 85). Herrigel did make some progress in the art of archery. At the end of his training his master said to him “You have become a different person in the course of these years. 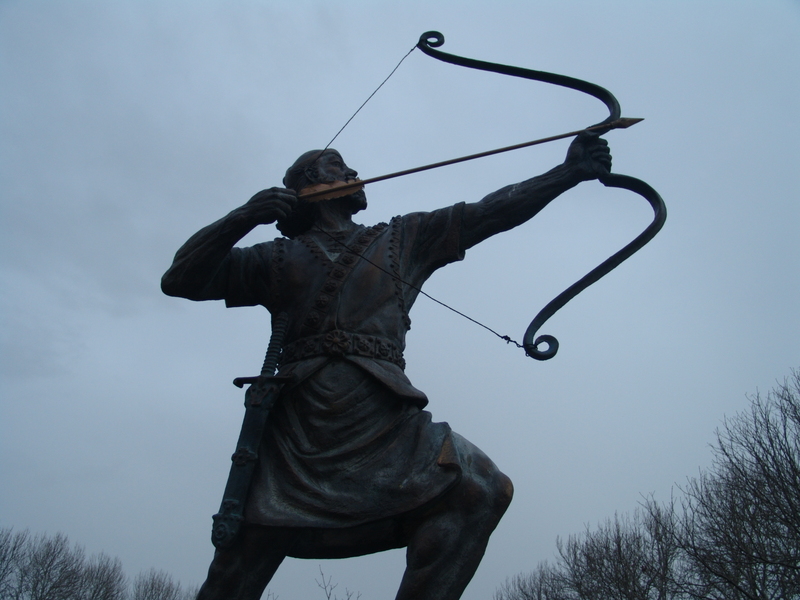 For this is what the art of archery means: a profound and far-reaching contest of the archer with himself” (p. 90). Does this help us to understand Stoicism? I think it might in the following way. The ancient charge that Stoicism becomes confused by proposing two goals – effectively trying to hit the target but also trying not to care if one misses – has not completely gone away. ‘Surely it is disingenuous to try to do something but then say you don’t care when it doesn’t work out.’ ‘If the Stoic is indifferent to the outcome of events, then why even try to do anything?’ What Herrigel’s account does is dismiss the first goal altogether: just forget about hitting the target. The real goal is not external at all; it is internal. It involves an internal transformation that, as it happens, will also improve one’s external successes, although that is now almost beside the point. What matters is how one acts, not the outcome of those acts. According to Herrigel this involves a process of letting go, just acting rather than over thinking. At first glance this might sound very Zen but not very Stoic and perhaps the point at which any parallel breaks down. But we might translate it into a broadly Stoic framework by saying that the advice is simply to follow Nature, to act spontaneously, to embrace one’s natural instincts, rather than to over think about what the right thing to do is. The Stoics do encourage people to follow ‘reason’ but this is the reason or order within Nature, which is not necessarily the same thing as deliberative, instrumental rationality. What the Zen art of archery and the Stoic art of living share is a seemingly paradoxical indifference to whether one is successful or not. What matters is mastering the art and practising it. In the case of Stoicism this means acting virtuously, with the right intentions, at all times and for its own sake. It is about cultivating the appropriate frame of mind that, as Herrigel’s master put it, enables one to enjoy an easy equanimity whether one hits one’s targets or not. John Sellars is currently a Research Fellow at King’s College London. His principal area of research is Ancient philosophy, but he is equally interested in its later influence and have wide interests in Medieval, Renaissance, and Early Modern philosophy. He has written two books on Stoic philosophy: Stoicism and The Art of Living. This article appeared originally in his blog, Miscellanea Stoica. Read more about John’s work on his website. Zen is intentionally paradoxical. Stoicism and most other Western philosophies use consistency as a criterion. The final goal of Zen Buddhism is enlightenment, a transcendental or non-natural state. The end of Stoicism is to live in accord with nature, not to transcend it. Zen training has some similarities with western ways because they both value self control and see pleasure as an obstacle to be overcome. My view would be that Theravada Buddhism would provide a better basis for comparison. Zen has more to so with difficulties in Chinese monasticism than with philosophy. I always had a probabilistic account to make sense of the arrow analogy. Suppose you do everything right and miss the target because of an external event while the opponent do everything wrong and still hit it! He may seem fortunate, but life is about recurrence. Try another 10 times and the one who is doing it right will hit say 8 times while the one depending on luck, none. It seems a nice way to justify the internal disposition in relation to external goals. But before we can rely on our instincts, we need to bring them into harmony with what the Stoics called “Nature.” When I look back on the the most regrettable acts of my life, I realize that, each time, I was “acting without thinking.” As a prokopton still seeking wisdom, I still have to force myself to stop and think before I respond to the words and actions of others. “Hatred is not only a vice, but a vice which goes point-blank against Nature. Hatred divides instead of joining and frustrates God’s will in human society. One man is born to help another. Hatred makes us destroy one another. Love unites—hatred separates. Love is beneficial—hatred is destructive. Love succors even strangers, hatred destroys the most intimate friendship. Love fills all hearts with joy, hatred ruins all those who possess it. Nature is bountiful, hatred is pernicious. cited in Davis, C.: Greek and Roman Stoicism. Boston: Herbert B. Turner and Co., 1903, pp. 226, 236, 241. Where is the problem in this? Stoicism has many targets. There is no Stoic principle that says it has only one or two targets. Stoicism is not only concerned with the individual’s attempts to live the ‘good life’ seen as experiencing a state of joy and happiness no matter what happens. It is concerned with actually living a life in harmony with the many aspects of the whole of existence. Stoicism is not just about the ‘inner world’. It is a materialist belief, and so is about bringing these many and various ‘targets’ together as one harmonious flow of inner contentment and outward striving. Much of John’s post perpetuates many of the misconceptions about Stoicism. Stoics are not indifferent. Stoics are accepting. There is a big difference. Stoicism is about looking outwards, not inwards.